Did not know a wrong number would change my life, said an elated Rahul Kumar while appreciating the inner beauty of his wife, an acid attack survivor, Lalita Benbansi. 26-six-year-old Lalita had been the victim of an acid attack in Azamgarh, Uttar Pradesh. Fate turned fearful for Lalita in 2012 when her cousins threw acid over her due to personal enmity. Owing to complete face burn, Lalita underwent 17 surgeries. Her treatment will now resume post her wedding. Lalita and her wedding with her suitor Rahul is no less than a Bollywood story. It happened with a wrong number when the latter dialed the former’s number accidentally. The flower of love blossomed between the two and after two months, the couple decided to get married. The wedding venue was the D’silva Technical College in Dadar. The bride wore an ornate crimson lehenga designed by the fashion stalwarts Abu-Sandeep. 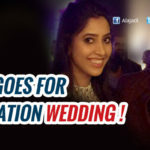 The glitzy wedding was attended by actor Vivek Oberoi, Congress MLA Nitish Rane and Dr. Jagannathrao Hegde, the former sheriff of Mumbai. Udyami Maharashtra, a business forum financed the expenses for the venue and function and also gifted a honeymoon package to the couple. Lalitha hails from Azamgarh in Uttar Pradesh and was allegedly attacked with acid in 2012 by her cousins, over a family dispute. She has so far undergone 17 surgeries and 12 more surgeries are lined up. She met Vivek Oberoi when she joined the Acid Survivors Saahas Foundation in 2016 and Oberoi calls her his ‘little sister’. Recently, Vivek Oberoi had gifted 25 flats to the families of 25 CRPF jawans who were killed in Sukma attack.